To prospectively compare the diagnostic performance of superparamagnetic iron oxide (SPIO)-enhanced magnetic resonance (MR) imaging at 3.0 T and 1.5 T for detection of hepatic metastases. A total of 28 patients (18 men, 10 women; mean age, 61 years) with 80 hepatic metastases were prospectively examined by SPIO-enhanced MR imaging at 3.0 T and 1.5 T. T1-weighted gradient-recalled-echo (GRE) images, T2*-weighted GRE images and T2-weighted fast spin-echo (SE) images were acquired. The tumour-to-liver contrast-to-noise ratio (CNR) of the lesions was calculated. Three observers independently reviewed each image. Image artefacts and overall image quality were analysed, sensitivity and positive predictive value for the detection of hepatic metastases were calculated, and diagnostic accuracy using the receiver-operating characteristics (ROC) method was evaluated. The tumour-to-liver CNRs were significantly higher at 3.0 T. Chemical shift and motion artefact were more severe, and overall image quality was worse on T2-weighted fast SE images at 3.0 T. Overall image quality of the two systems was similar on T1-weighted GRE images and T2*-weighted GRE images. Sensitivity and area under the ROC curve for the 3.0-T image sets were significantly higher. 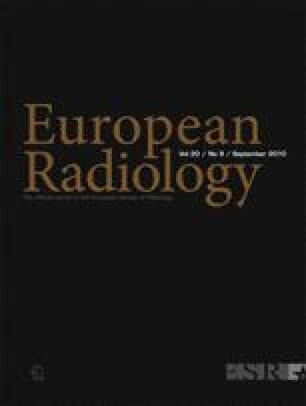 SPIO-enhanced MR imaging at 3.0 T provided better diagnostic performance for detection of hepatic metastases than 1.5 T.